As a photographer, I'm sure that you are aware of the importance of quality product images. However, taking quality product images can be time consuming. I of course want good product images to use on the site, but time is my most precious resource. So, I need a setup that allows me to efficiently capture quality images of a wide range of products, from lenses to tripods to anything else that crosses my desk. 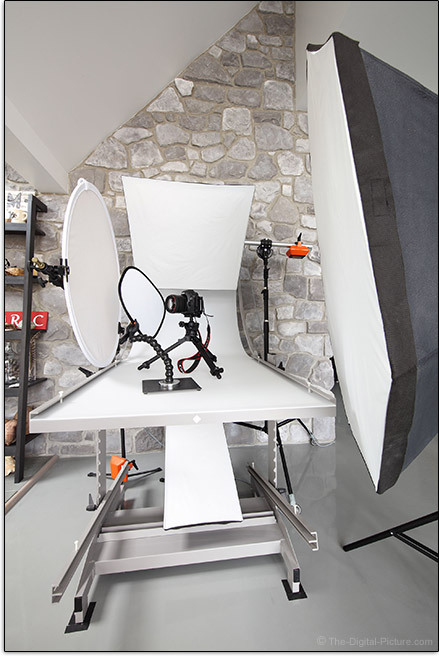 The base of my product photography setup is a shooting table. This table is always ready to go, providing a seamless white sweep that can be lit from above or below, can be hit with gel'd light if color is needed and can have a background draped over or built onto it. My shooting table is an (apparently) discontinued Elinchrom Still Life Table, but many other options are available in a wide range of sizes and prices. I find the Manfrotto shooting tables very attractive in terms of quality for the price. I generally have three monolights set up around the table. The brand matters less than the quality of the lights and the quality of light, but ... often the brand indicates the quality of both. The physical quality required by this setup is not terribly high, but reliability has a lot of value to me. I selected and built my lighting kit on the Elinchrom brand and over 10 years later, I have experienced only one failure. And, I have only myself to blame for that one. I was carrying two light stands at the same time and one became unbalanced. It is a terrible feeling to watch a 1200 Ws light hit the concrete floor from about 9' (3m) up. Fortunately, Elinchrom repaired it for what I thought was a very reasonable price and within a reasonably short time period. The power of the lights is another consideration. While close working distances reduce the power needed for small product photography, having extra power can shorter recycle times and can be very useful for other monolights needs including portraits. Light output can be adjusted and more power usually means more versatility. I have 300 Ws, 600 Ws and 1200 Ws lights in this setup (and have an additional 600 Ws light to bring in as needed). Each of my three lights are fired into softboxes. I use brand-matching Elinchrom softboxes. The main light is positioned to camera right, mounted on a Manfrotto light stand and fired into an Elinchrom Rotalux Octa Softbox. The 53" (134.6cm) softbox, positioned close to the subject, provides a soft light that wraps around any subject sized small enough to fit on my shooting table. The octagonal shape provides a rounded reflection in any subject that shows such. This light is responsible for the broad white vertical reflection in the front/right side of many of the product images appearing on this site. Keep in mind that lens images are often rotated 90° prior to being uploaded to the site, so ... this reflection may be running horizontal across the upper portion of the images you are looking at. The second and third lights are nearly always used, but usually not at the same time. The second light hangs from a Manfrotto Heavy Duty Boom on a Manfrotto light stand. This light is fired into an Elinchrom Rotalux 27" (68.6cm) Square Softbox angled toward the table-centered subject from above/behind. The overhead light provides a bright rim on the subjects it is used for, including the lenses when getting their standard product images captured. I don't always use this light because the rim light is too much on some subjects. When not in use, the overhead light remains in its position with the softbox acting as a reflector, sending some of the main light back onto the subject and providing an attractive white reflecting surface for reflective subjects. The third light is positioned under the table, nearly on the floor. A stud on a Manfrotto Backlight Stand holds this light and the Elinchrom Rotalux 14x35" (36x89cm) Softbox positioned above it. This soft light, when used, hits the translucent table surface, aids in the creation of a white background. On camera-left, against the table, is a Photoflex Litedisc 32" Circular Reflector. The reflector is held by a Photoflex Litedisc Holder mounted to a weighted background stand with an extension pole. This reflector is responsible for bouncing some of the main light onto the shaded side of the subject and for creating a secondary light reflection running vertically down the left side of the subject (or horizontally across the bottom if the image is rotated). The brightness of the lights was originally adjusted to taste and I rarely need to adjust them for this work. The standard settings usually produce an ideal brightness and overall balance for the f/11 images captured at 1/160. Due to the extremely short duration of the strobe lights, the shutter speed is not important aside from being long enough be open for the full light pulse. Note that I am not creating a pure white background in camera. Doing so, at least without careful flagging, can result in a strong white reflection from the shooting surface along the sides of the product being photographed. You've seen this. Products appear to get brighter at their edges and then blend into the white background. These reflections take away from the crisp edges and reduce the quality of many product images. While I want a white background, I do not want the white background reflecting harshly on the product. So, the site's images are cut out in Photoshop during post processing. The camera triggers the main light using PocketWizard transceivers and the additional lights are optically-triggered via their built-in feature. Nearly any current model DSLR camera will be adequate for product photography as this is not a camera-challenging task. However, some requirements may dictate that an ultra-high resolution model be used. I most frequently use a Canon EOS-1Ds Mark III that basically lives in my studio. While general product images are typically captured handheld using a Canon EF 70-200mm f/4L IS USM Lens, the standardized images used in the comparisons are captured using a Canon EF 180mm f/3.5L USM Macro Lens. This lens is locked-down on a Manfrotto 400 Deluxe Geared Head mounted to a modified Manfrotto O800 Static Camera Stand (apparently discontinued). The geared heads are very nice (we use several of them) and the relatively compact camera stand, while very heavy and rugged, shows a surprising amount of vibration in its center pole. So, a little care must be utilized to keep the camera motionless during the exposure (though the fast strobe lights basically eliminate any chance of motion blur). When is the best time to take product photos? Immediately upon removing the item from the packaging. Most products come with some authentic factory dust, but introducing third party dust only makes for increased post processing work. And, fingerprints are even harder to remove. Getting the product images before using the item is usually the priority, though it can be painful to get a $10,000 lens and not be able to use it until taking its pictures. Photoshopping drool out of product images is never fun. Product image post processing usually involves changing the Picture Style to Standard in DPP, the sharpness to "2" and the contrast to "1". The products are then dusted and cut out in Photoshop. 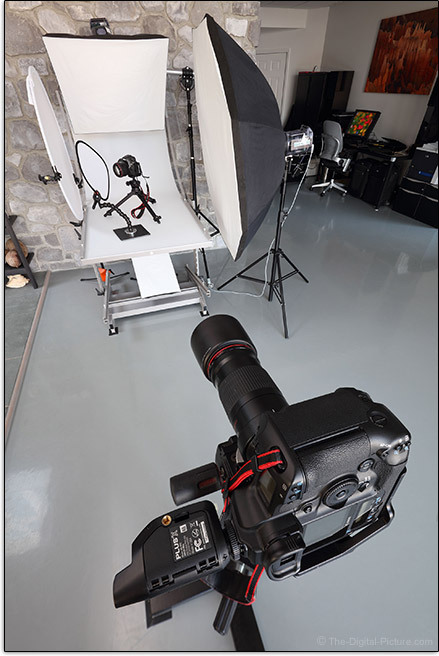 Examples of product images captured using this setup accompany nearly every lens and accessory review on the site. To get you started, here is a lens comparison utilizing the site's lens product image comparison tool. There are nearly infinite options for creating product images, but the setup described above has proven to work very well for my general purpose needs. I can place nearly any product (or the occasional rabbit) on the table, turn on the lights and begin capturing quality images in a minute or two (though aligning for the standard product images is still quite time consuming). Hopefully the "I wonder how he gets those product images?" question has now been answered for you.